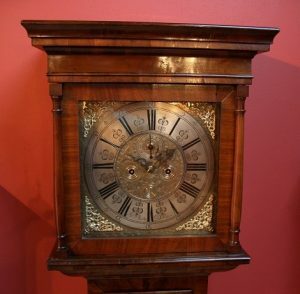 Walnut cased Queen Anne period longcase clock made by John Burton of Dublin. Beatifully inlaid with various fruitwoods and with original bracket feet. 13″ brass dial with supplementary seconds dial and calendar aperture and cast brass spandrels. Striking on original bell with Internal count wheel. Fully restored with one years guarantee. Ref: m0506.